DnsCloud Review 2019: Is DnsCloud a Good Hosting? Dnscloud is an Israeli website hosting company that offers Windows and Linux hosting that's good for personal and some small business sites. Their plans are a bit lacking on storage, so your growth potential will be limited. Dnscloud is one of is Israel’s oldest website hosting companies. In business since 2001, they offer a variety of website hosting and cloud computing services. Their website hosting is an excellent option for smaller websites including some small business websites. However, if you require robust storage, they are not a good choice. With a firewall, DDoS, and antivirus protection, Dnscloud offers security you don’t see on many shared web hosts. Daily backups are also a nice bonus where most companies only offer weekly backups if they offer backups at all. I would like to see additional support for programming languages such as Python and Ruby on Rails, but they do offer PHP access through 7.2. Dnscloud is excellent for beginners as they offer nearly 200 customizable templates as well as the Softaculous auto-installer with hundreds of scripts such as WordPress. You can also use cPanel or Plesk to upload files to your website. These features are the same regardless of whether you choose Windows or Linux hosting. For Linux hosting, you get standard cPanel access while Windows hosting uses Plesk. Note that SSL certificates are not free on this host, so you will incur a fee on each site that requires an SSL certificate. I’m not a fan of the available storage for the multi-domain plans. A max of 4GB is going to be restrictive for E-commerce stores or those with large storage requirements. That’s why I only recommend them for personal and small business sites that don’t need a lot of storage. Dnscloud offers solid support, but they are not 24/7. They offer live chat, telephone and ticket support from Sunday through Thursday from 9 a.m. to 6 p.m. GMT+3. 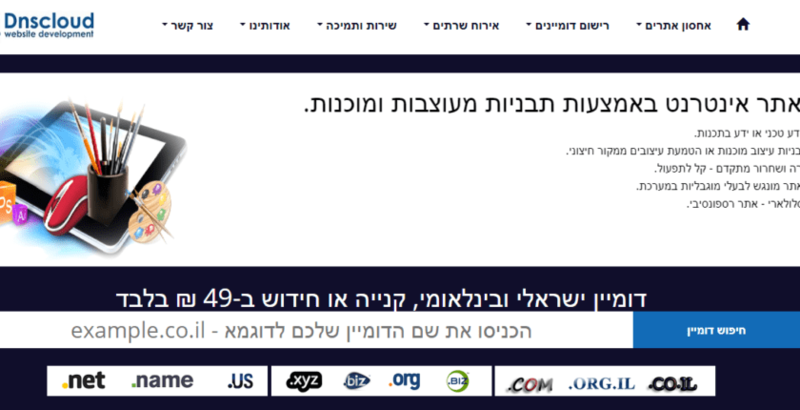 While their website is in Hebrew, they do offer English support. I would prefer to see 24/7 support, but with their primary focus being in Israel, their schedule makes sense for their primary market. Dnscloud is a dependable provider that offers strong security for their sites. However, with the limits on storage, it is not ideal for a larger website or those hosting multiple websites with robust storage needs. Wondering how DnsCloud stacks up against other Web Hosting companies? Enter any other Web Hosting company and we will give you a side-by-side comparison.